NBC's Keir Simmons takes a look at how countries around the world are mourning the unbelievable tragedy that has shaken Newtown, Conn.
NEWTOWN, Conn. -- The outpouring of shock and grief from around the world over the horrific events in this picturesque New England town has given way to another widely felt, powerful emotion: the urge to support the shattered families of the victims. 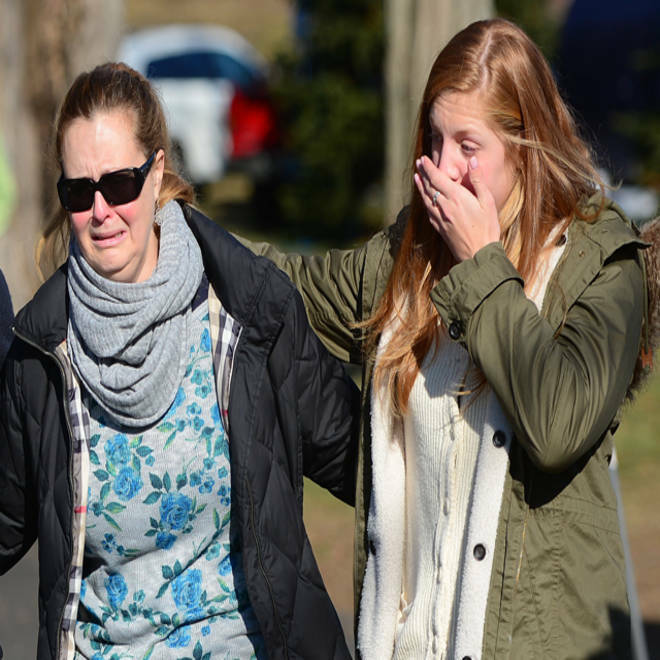 As details of Friday’s mass shooting at Sandy Hook Elementary continue to unfold, residents remain stunned by the mayhem unleashed by a lone gunman. On Saturday, authorities disclosed the names of the 12 girls, eight boys and six adult women who were killed in the nation's second-worst school shooting. The scope of the tragedy has been matched by a torrent of offers to help. Since just hours after the massacre, local churches and social service agencies have been besieged with phone calls and emails from around the country and the world -- as far away as Taiwan, Australia and West Africa. Some callers express a sense of powerlessness in trying to help shattered families rebuild their lives, along with a bewilderment in trying to know what to do. The outpouring of global grief has generated a flood of offers of financial contributions, according to Newtown Savings Bank President John Trentacosta. In response, several groups have set up websites to accept contributions, including a joint effort between Newtown Savings and the United Way of Western Connecticut. The Sandy Hook School Support Fund is accepting donations via the Web, or by check mailed to Sandy Hook School Support Fund, Newtown Savings Bank, 39 Main St., Newtown CT 06470. Donations are also being accepted at the bank's local branches. Local residents have also taken up the cause. Neighbors and friends have been preparing meals for the bereaved families, and counseling agencies have tapped an influx of volunteers to help cope with the psychological trauma. Clad in Santa caps and armed with a handwritten "Santas for Sandy Hook" sign, Zoe Walter, 21, her sister and a friend stood outside a local coffee and donuts shop Saturday asking for donations to the newly created support fund. As she briefly silenced her handbell, Walter said she was shaken by the killings. "I just want them to know that we care and we're here, and we'll do anything that we can (to) help," said Walter, a college student, as she broke down in tears. "I just want them to know that we're thinking about them." Countries that have experienced similar tragedies tonight stand shoulder-to-shoulder with America as it mourns the deaths of 28, most of them young children. NBC's Annabel Roberts reports. At New Hope Community Church, pastor Jim Solomon has been fielding calls since shortly after the Friday morning tragedy. In response, Solomon has also set up a fund on the church’s Web site, asking contributors for suggestions on how the money should be spent. 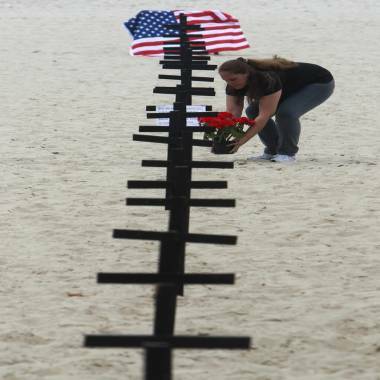 A woman puts some flowers next to crosses on Copacabana beach, Rio de Janeiro. Brazil, on Saturday as a tribute to the shooting victims at Sandy Hook Elementary School in Newtown, Conn.
“If they indicate what the funds are for, the church treasurer is going to dispense those funds to help each of the particular families,” he said. “We’re going to use that money to help each family with food or funeral and memorial services, burial expenses or any other needs so we can help them in a very practical way." Solomon, a counselor, is also a board member at Newtown Youth and Family Services, which is offering free counseling to victims’ families and other residents. In the aftermath of natural disasters, communities often see an influx of donated food, clothing and other emergency supplies. Local clergy say the school shooting in Newtown was a very different type of disaster, calling for a very different response. 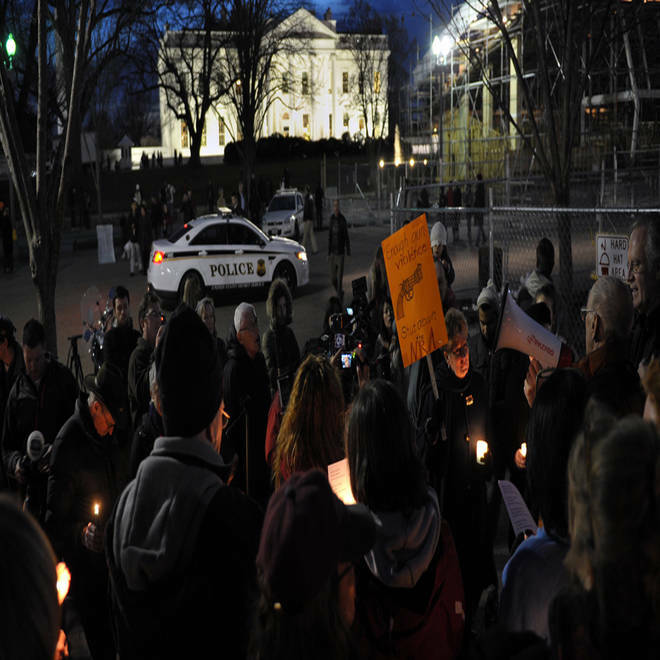 Gun control supporters take part in a candlelight vigil at Lafayette Square across from the White House on Saturday. In a world awash in social media, grief also flowed online. On Twitter, the #Newtown hashtag emerged almost immediately, promptly flooded with emotional outpouring and soon began trending. On Google+, many gathered around the topic "Sandy Hook" for consolation. Facebook users created multiple pages to share news and prayers with friends. Reddit users inundated the Connecticut subreddit with fundraising initiatives, local news, and opportunities to "vent your fears, anger, frustration and anything else." By midday Saturday, the local NewtownPatch had drawn more than 500 “I want to help” comments on a page devoted to supporting local residents. In Newtown, some people are showing their support just by showing up. At a Friday night vigil at St. Rose of Lima church, the crowd spilled out into the freezing weather, trying to make sense of the tragedy. Another townwide vigil is planned for Sunday night at Newtown High School. Pakistani children light candles to pay tribute to U.S. elementary school shooting victims in the southern Pakistani port city of Karachi. McIlrath, who plans to speak at the service, was still working out what he wants to say. NBC's Miranda Leitsinger and Rosa Golijan contributed to this report.